The L16A2 / M252 81 mm medium weight Mortar is an British smooth bore, muzzle-loading, high-angle-of-fire weapon used for long-range indirect fire support to light infantry, air assault, and airborne units across the entire front of a battalion zone of influence. In the US Army and US Marine Corps, it is normally deployed in the mortar platoon of an infantry battalion. The M252 system weighs 91 lb (41 kg) completely assembled and is composed of the M253 Cannon (35 lb, 16 kg), M177 Mount (27 lb, 12 kg), M3A1 Baseplate (29 lb, 13 kg), and the M64A1 Sight Unit (2.5 lb, 1.1 kg). The mount consists of a bipod and a base plate which is provided with screw type elevating and traversing mechanisms to elevate/traverse the mortar. The M64A1 sight unit (also used on the M224) is attached to the bipod mount. The M252 is a is a gravity-fired smooth bore system. Attached to the muzzle of the weapon is the Blast Attenuation Device (BAD), used to reduce the blast effects on the mortar crew. To increase cooling efficiency, the breech end is finned. The cannon also has a crew-removable breech plug and firing pin. 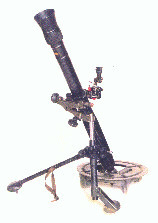 The M252 entered service with the US Army in 1987 and replaced the previous Marine Corps 81 mm mortar in 1986. The M252 is an adaptation of the standard British 81 mm mortar developed in the 1970s. Outside of the U.S. it is known as the L16A2. It was adopted due to the extended range (4,500 meters to 5,650 meters) and lethality it provides in comparison to the previous 81 mm mortar (the M29). In the U.S. it is produced by Watervliet Arsenals. The M252 uses a crew of five enlisted personnel to operate: the squad leader, the gunner, the assistant gunner, the first ammunition bearer, and the second ammunition bearer. The squad leader stands directly behind the mortar where he can command and control his squad. In addition to having general oversight of all squad activities, he also supervises the emplacement, laying, and firing of the weapon. The gunner stands to the left of the mortar where he can manipulate the sight, traversing handwheel, and elevating handwheel. He places firing data on the sight and lays the mortar for deflection and elevation. He makes large deflection shifts by shifting the bipod assembly and keeps the bubbles level during firing. The assistant gunner stands to the right of the mortar, facing the barrel and ready to load. In addition to loading, he swabs the bore after 10 rounds have been fired or after each fire mission. The assistant gunner is the person that actually fires the weapon. The first ammunition bearer stands to the right rear of the mortar. He has the duty of preparing the ammunition (charge settings, fuses, etc...) and passing it to the assistant gunner. The second ammunition bearer stands to the right rear of the mortar behind the ammunition bearer. He maintains the ammunition for firing and provides local security for the mortar position. While the M252 does fire a weapon specific series of ammunition, it can also fire rounds from the M29 Mortar (only at charge 3 or below though). The M252 Mortar can fire the following principal classifications of training and service ammunition. High explosive (HE)--Designations M821, M889, M372-series, and M362. Used against personnel and light materiel targets. White phosphorus (WP)--Designations M819 and M375-series. Used as a screening, signaling, casualty-producing, or incendiary agent. Red Phosphorus (RP) may also be used. Illumination (ILLUM)--Designations M853A1 and M301-series. Used in night missions requiring illumination for assistance in observation. Training practice (TP)--Designations M880, M879, M68 and sabot. Used for training in limited areas. The M224 rounds have two fuse types: The Multioption Fuze (M734) and the Point-Detonating Fuze (M935). The M734 is used for the M720 HE round and can be set to function as proximity burst, near-surface burst, impact burst, or delay burst.